There are two basic ways to fix crooked teeth. Most people think of braces as the only way to address this problem. It’s a very effective way, and it has its advantages, but also its disadvantages. Nothing artificial has to be bonded to your teeth. It generally gives the healthiest result. Once you are done, there is no maintenance required, and there is nothing to be replaced. It can take two or three years to complete treatment. Wearing braces is uncomfortable and unattractive. There is a chance for relapse—once your teeth are straightened, they can go out of alignment again. Some of these disadvantages are addressed by using Invisalign invisible braces. While these are more expensive than regular braces, they are faster (treatments are generally completed in a year or less), much more comfortable and attractive. There is another way to fix crooked teeth, and that is with porcelain veneers. 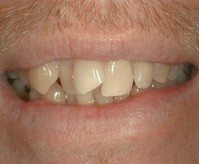 With porcelain veneers, the fronts of your front teeth are shaved a little, and thin porcelain laminates are placed over them, creating the appearance of being straight. Here are photographs of an actual case. This is a patient who was treated by one of our recommended dentists from California. The crooked teeth in the “before” photo have not been moved, they have been merely covered with veneers so that they look straight. This was an extremely difficult case because the teeth are so jumbled, as you can see. But the patient didn’t want braces. Expert cosmetic dentists are all able to do this for patients. And if you want results in two appointments, this way works. Below is another case of crooked teeth restored with porcelain veneers. This case was done by Dr. Larry Addleson of San Diego, California. In this particular case, the patient’s two front teeth were turned slightly sideways. Using braces alone would have achieved a less desirable result because of the problems with the shape and color of the front teeth. 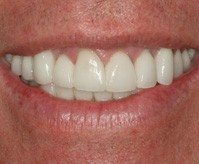 Porcelain veneers gave the teeth a uniform color, a pleasing shape, and corrected the badly worn places in the biting edges of the teeth. 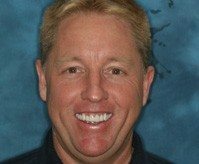 With only four porcelain veneers, Dr. Addleson was able to achieve a beautiful result. Treatment can be completed in two appointments. You get to enjoy your beautiful smile for more time, because you don’t have to wait for results. There is little chance of relapse. Since your teeth start in a stable position, there is no tendency for them to move “back” to their original position. This way is more expensive. You have to be more careful about keeping your teeth clean—brushing and flossing your teeth carefully every day is more important once you have porcelain veneers. Read all about porcelain veneers.